The Burgeoning Pearl of the Musi | What an Amazing World! September 2004. First time in almost five decades that the Indonesian National Games (PON) were hosted by a city outside the island of Java. 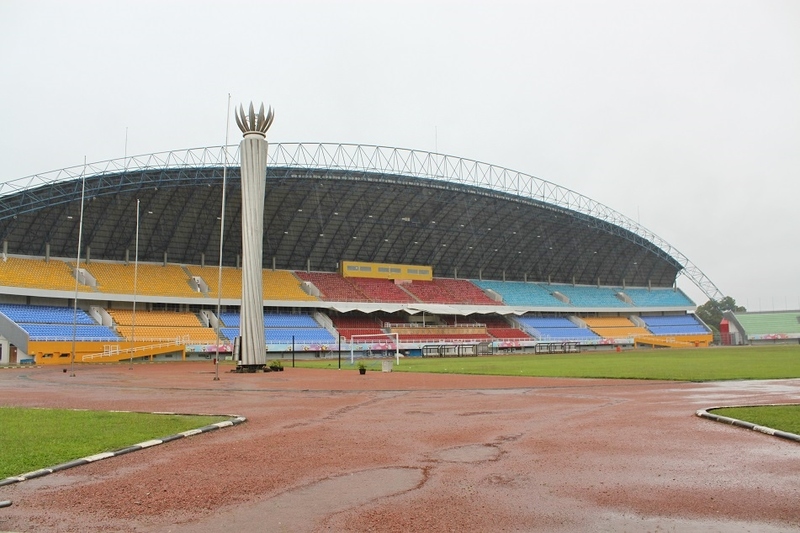 A 40,000-seater stadium was built in Palembang, the capital of South Sumatra province, quite possibly the second biggest in the country at that time after the 80,000-seater national stadium in Jakarta. New infrastructures were constructed, including a modern airport that put those of Indonesia’s bigger cities in shame. November 2011. Indonesia once again hosted the Southeast Asian Games, a bi-annual multi-sporting event that brings together athletes from 11 countries in the region, 14 years after Jakarta last hosted the games. It was the first time for a non-capital city in Indonesia, but 16 years after Thailand’s Chiang Mai in 1995, to ever host the games with Palembang providing most venues for the two-week event. March 2015. I embarked on a short trip to Palembang to learn how much the major sporting events have changed the city, once known only for the Musi – the local equivalent to Bangkok’s Chao Phraya – and a fish-based dish called pempek, and its people. 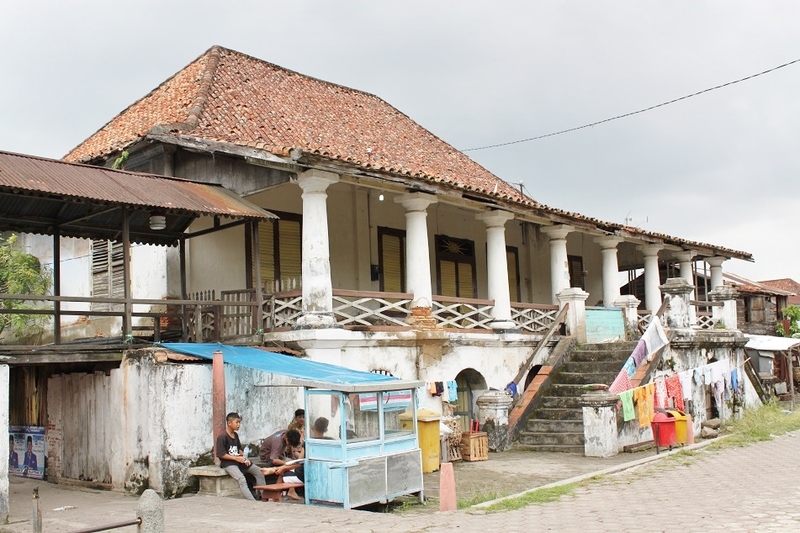 Before the 1920s, the locals were completely unaware of the existence of a once powerful kingdom which was based out of an area in modern-day Palembang, whose influence straddled vast regions from Sumatra to Java and the Malay peninsula. In early 1920s a French scholar by the name of George Cœdès, at the time working for the Hanoi-based École française d’Extrême-Orient, brought this kingdom from obscurity to public attention. The kingdom of Srivijaya was in fact an influential power in maritime Southeast Asia between the 7th – 14th century AD, thanks to its formidable naval forces which controlled the lucrative sea trade route between China and India. 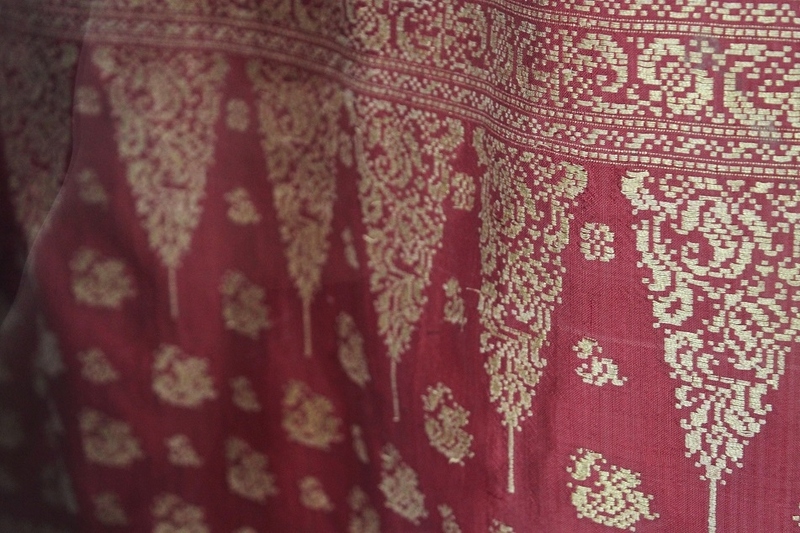 This geographical advantage accelerated foreign culture and religion introduction by traders, which helped Srivijaya establish itself as the center of Buddhism teaching in Southeast Asia. 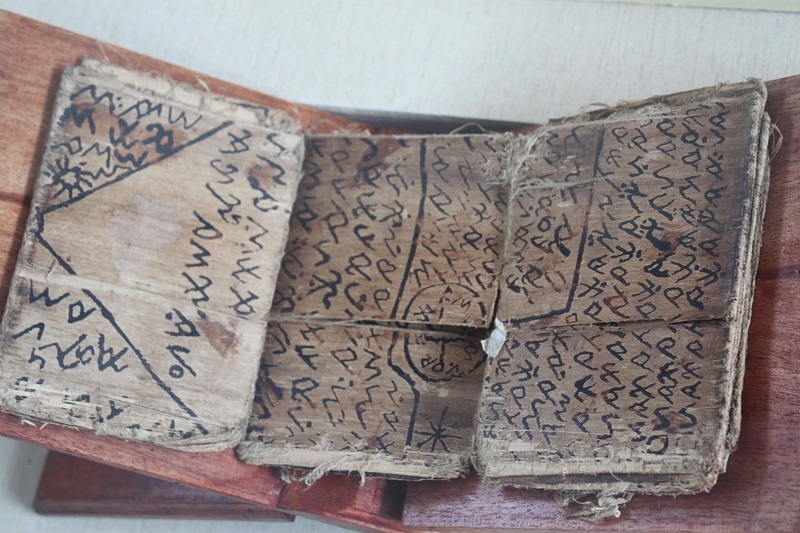 Yijing (I Tsing/I Ching), a Chinese monk who lived between 635 – 713 AD, traveled extensively from China to India and recorded the kingdoms and peoples he saw in between, including Srivijaya. 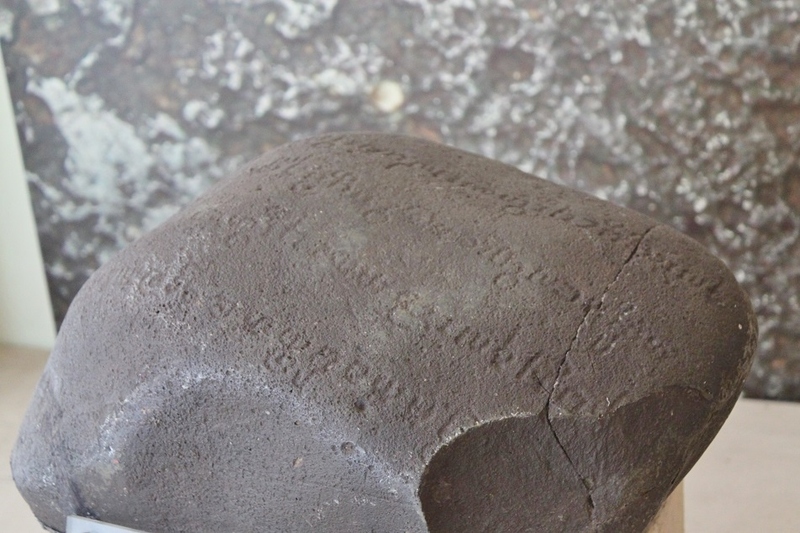 Yijing’s account on the Sumatra-based kingdom describes his call for Chinese monks to stay in Srivijaya for a year or two on their way to learn about Buddhism in Nalanda, India. 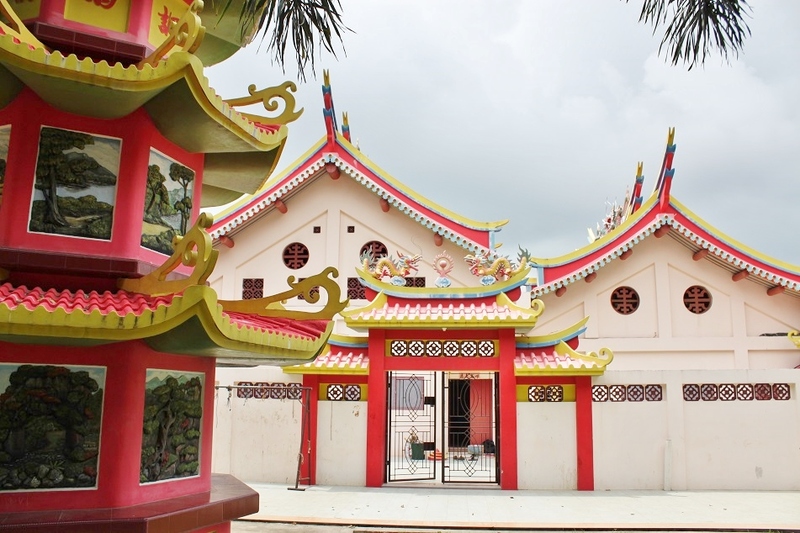 Over the centuries monks and traders from China frequented Palembang, some even decided to settle in the foreign land to start their lives anew. This trend had not receded even after Srivijaya’s fall in the 14th century. But instead of monks, it was the Chinese pirates who later found Palembang perfect as a safe haven to launch raids towards trade ships passing through the surrounding waters. James and I boarded a small motor boat, smaller and more narrow than I imagined, and sat on the boat’s floor with our legs folded towards our chest – legroom was clearly something the boat maker did not bother to think of. 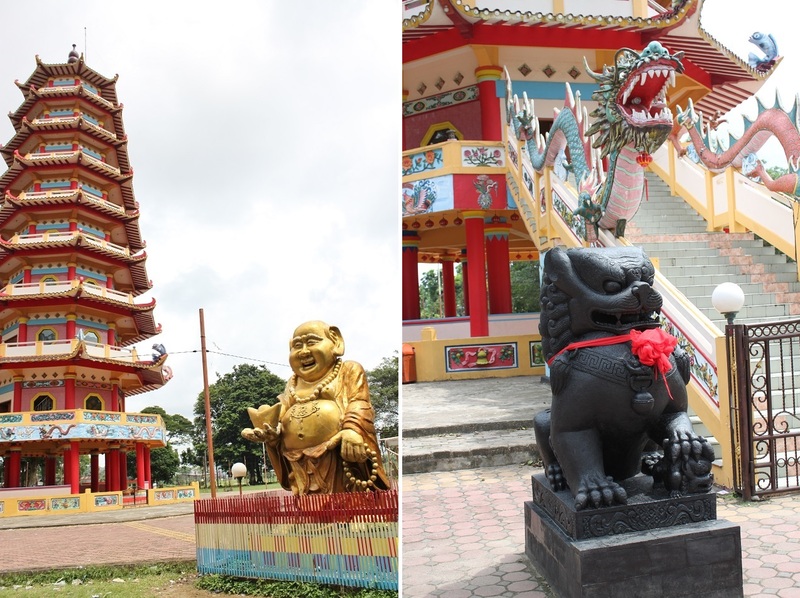 That morning we were heading to Pulau Kemaro (Kemaro Island), famous for its Chinese temple and pagoda, about 6 km from the pier near the iconic Ampera Bridge down the wide and murky Musi River. 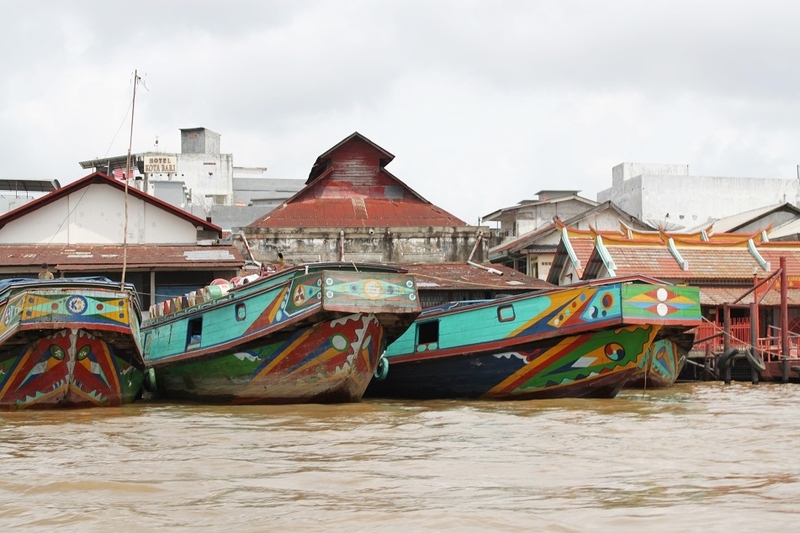 The boat ride turned out to be more scary than I anticipated as the seemingly frail boat waded its way across the Musi, past docked fishing vessels, small and large, traditional and modern, along its banks. The Musi has been the lifeblood of the locals for centuries, yet those who live on the riverside seem to be the ones less fortunate. Modest stilt houses, some even looked dilapidated, thronged the riverbank jostling for space with mosques, shops, and other tenements. 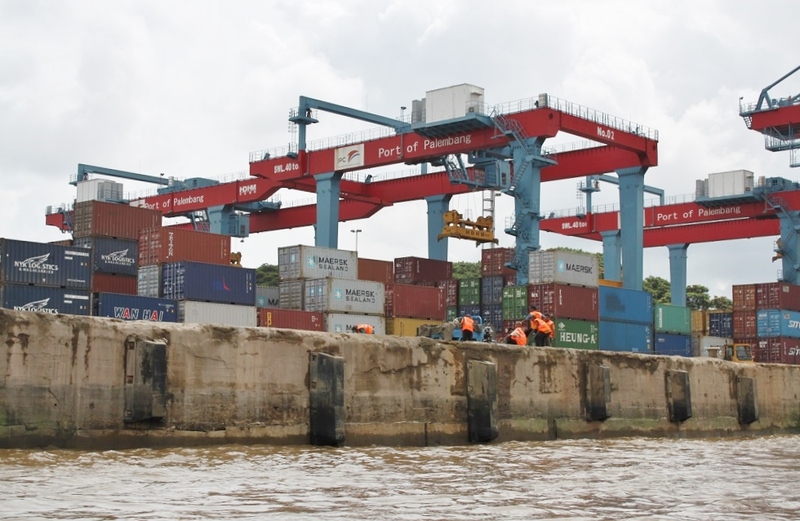 At one turn, a large inland container terminal flaunted its giant gantry cranes, a telltale of Palembang’s thriving economy. Not too far from it an enormous fertilizer company emitted a foul stench which reminded me of high school chemistry experiments with ammonia. Only this time it was a lot more intense. Docked on its quay were massive vessels easily dwarfing our boat. 20 minutes after we left the pier, a pagoda slowly emerged from the horizon. Pulau Kemaro was already in sight. 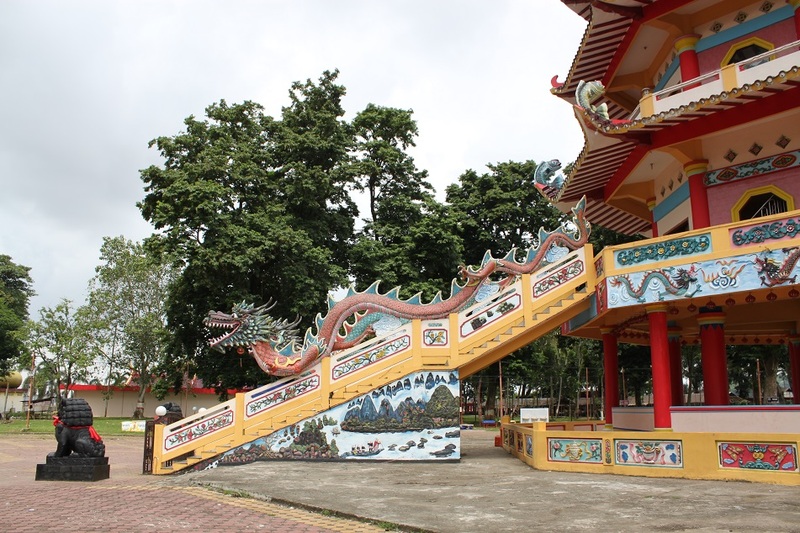 Its pagoda and Chinese temple, as well as the famously elaborate celebration of Cap Go Meh (the fifteenth and final day of Chinese New Year celebration), are the main reasons for people to come to this improbably tranquil island tucked away in the middle of the city’s industrial face. 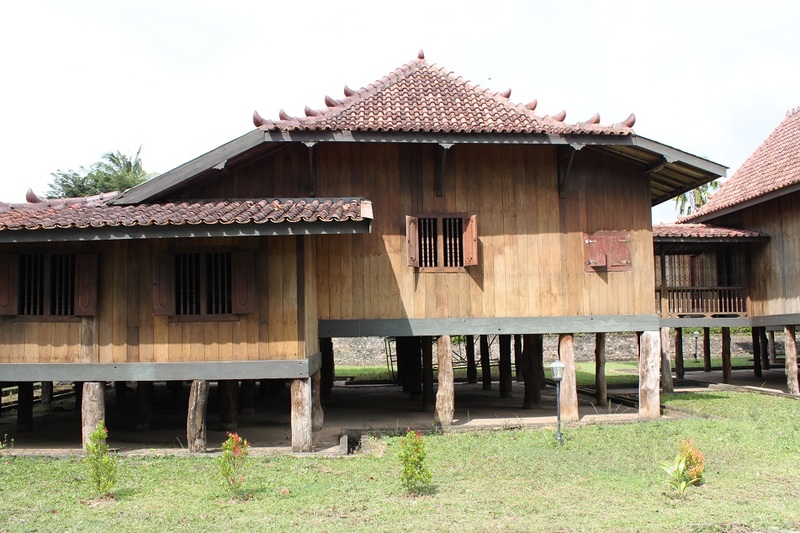 The island’s legend itself is a fascinating recount on Palembang’s long history of intermarriage. 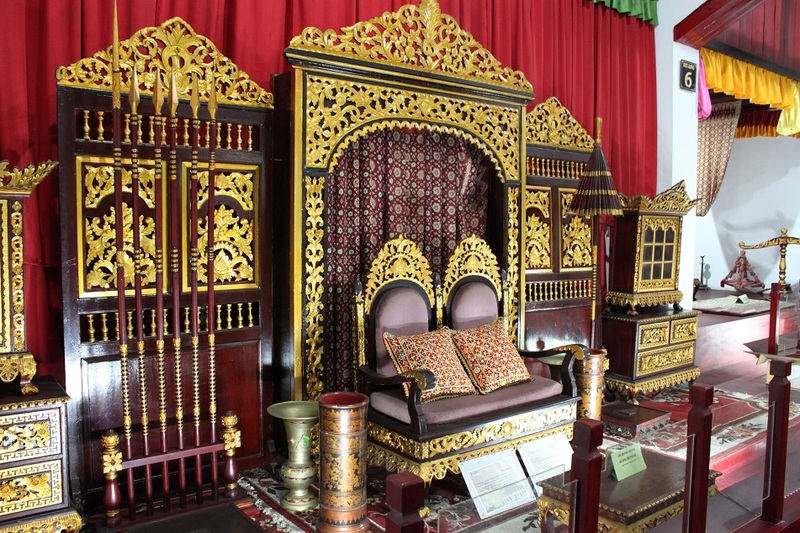 It is said that a local princess, Siti Fatimah, married a Chinese merchant called Tan Bun An. 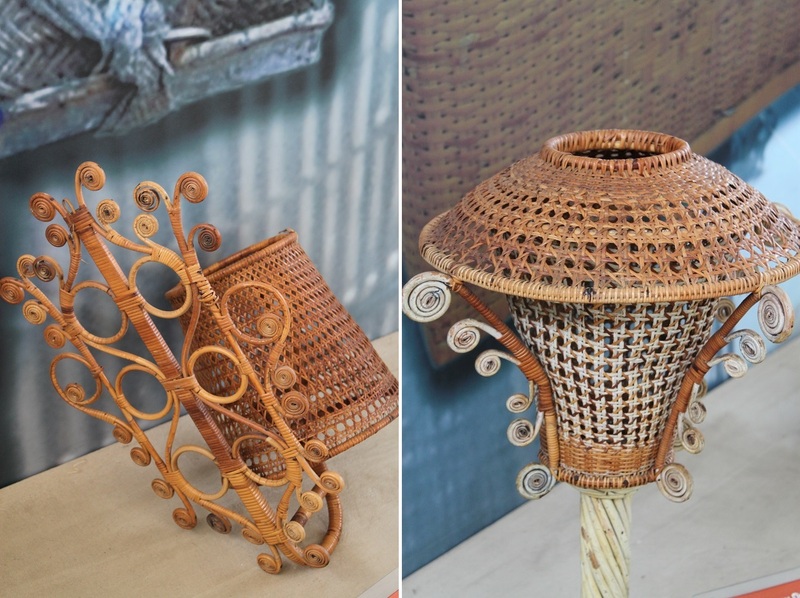 One day they travelled to China to visit Tan Bun An’s parents who then gave them seven jars to bring home. As they reached the Musi, the merchant opened the jars, and much to his disappointment they were only filled with Chinese cabbage. He then threw the jars to the river, and before the final jar was thrown overboard, it fell and broke, revealing the treasure hidden beneath the cabbage. Soon he and his guard jumped into the river to retrieve the other six, but they never resurfaced. In desperation Siti Fatimah followed them, only to face the same grim fate. 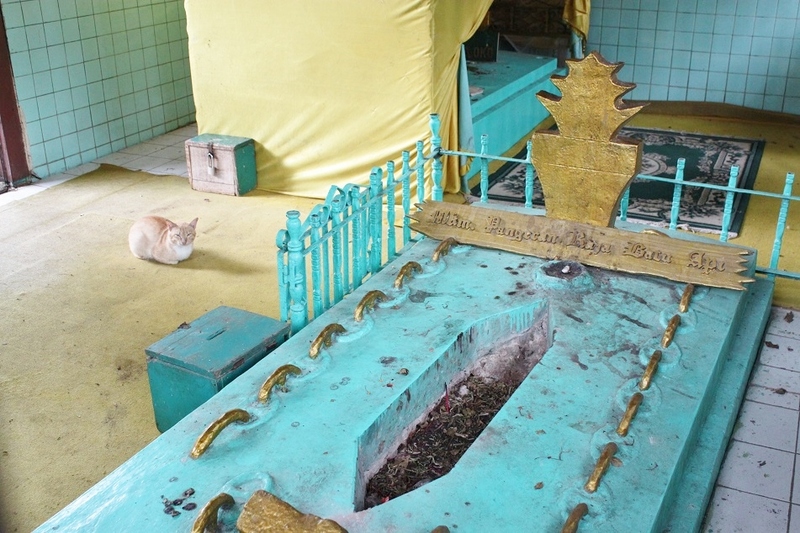 Judging from the princess’ Muslim name the legend supposedly took place in the time of the Palembang Sultanate, long after the fall of the Buddhist Srivijaya. 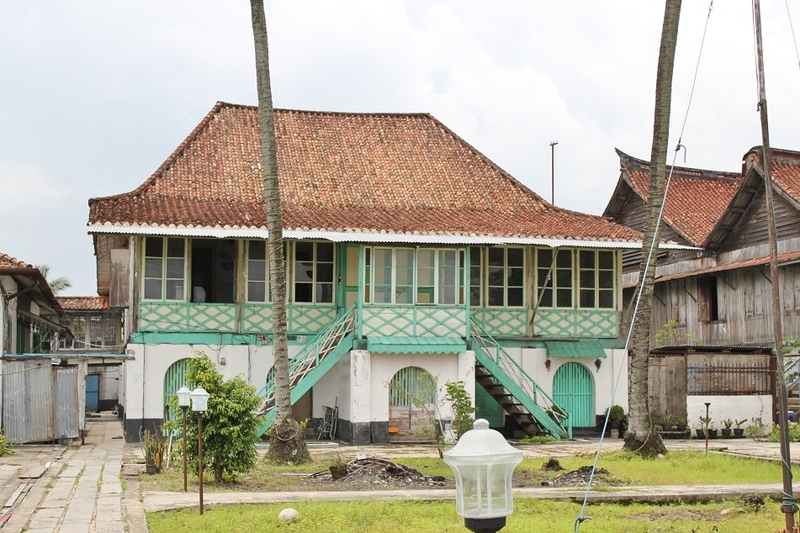 But the cross-cultural legacy remains very much alive in present-day Palembang, as was palpable in Kampung Kapitan, just across the pier where the boat trip began. 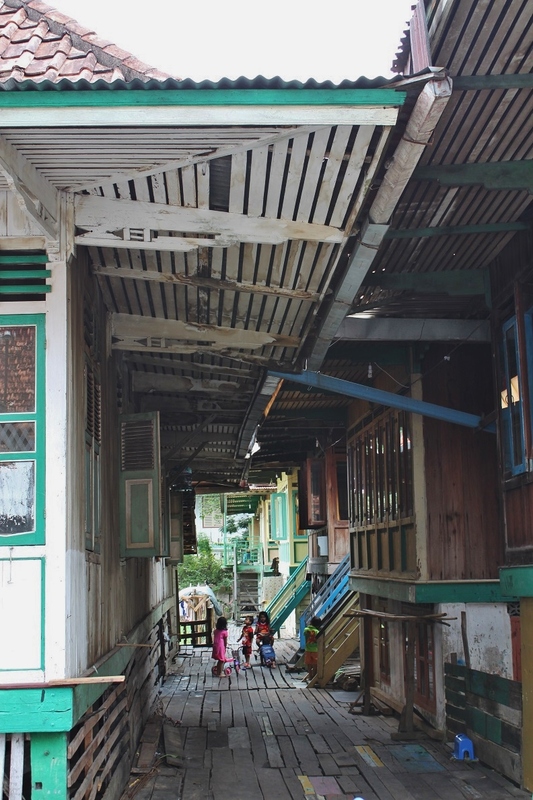 Once a Chinese community neighborhood, Kampung Kapitan today is a densely populated district with only a handful of Chinese descendants still dwell in some of the old houses. 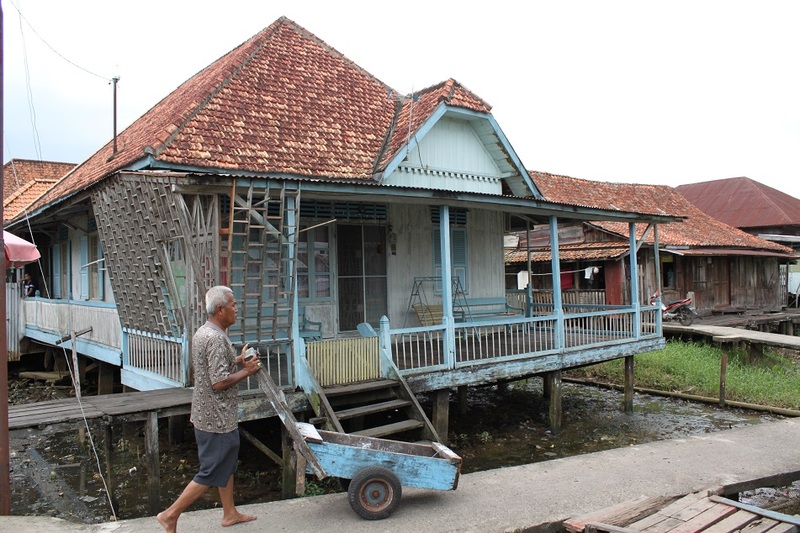 At the other side of the river, directly facing Kampung Kapitan’s stilt houses, was Palembang’s prettier face with new restaurants and cafes occupying a modern multi-storeyed building. Behind it a well-tended museum stood gracefully with a main building flanked by two ancient statues dating back to Srivijaya time. 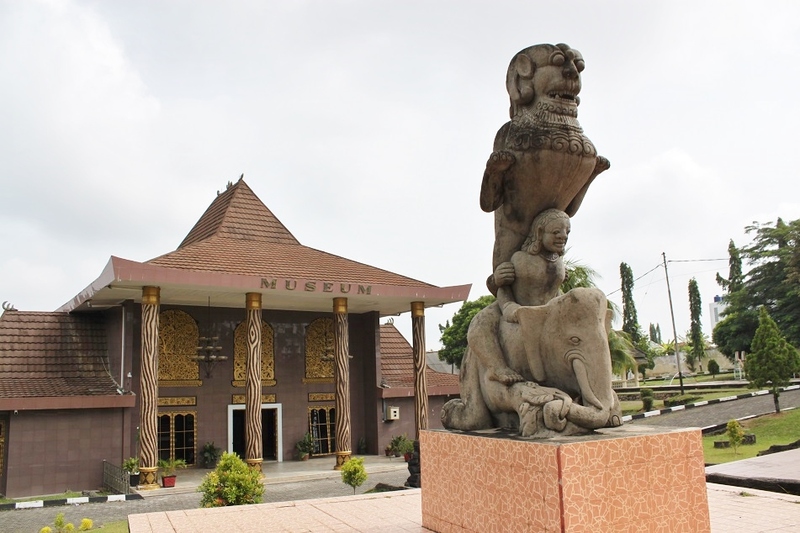 Museum Sultan Mahmud Badaruddin II, named after the most revered ruler of the 17th – 19th century Sultanate of Palembang Darussalam known for his boldness to fight against the British and the Dutch, was home to a collection of artifacts of the sultanate, completely fell under the Dutch control in 1823. The sultan himself was captured and exiled to Ternate, more than 4,000 km by ship to the east. 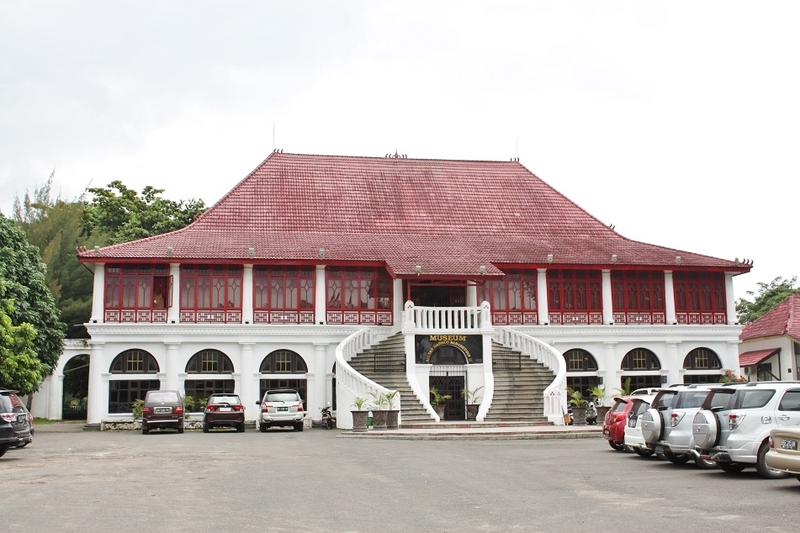 But his bravery is now remembered and immortalized not only as the name of the museum, but also as South Sumatra’s sole international airport, as well as the portrait that adorns the obverse of the 10,000-rupiah banknote. There were parts of Palembang which met my expectations: the industrial gritty feel, densely-populated neighborhood, and the murkiness of the Musi – at times overwhelming. But there were other things which were surprisingly better than I anticipated. A former coworker a few years ago told me how dangerous Palembang was as, according to her, it had the second highest crime rate among Indonesian provincial capitals. That preconception was very much instilled in my head, although it didn’t deter me from deciding to visit Kampung Kapitan, a typical low-income neighborhood often associated with social problems. However I was glad my visit proved it wrong. 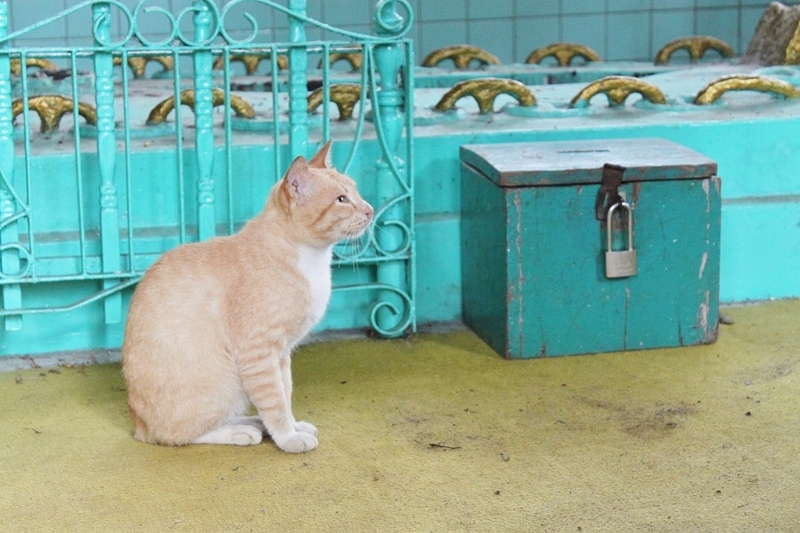 Not only did I feel safe when I explored Kampung Kapitan’s narrow alleys, snaking amid small houses with weathered walls made from wooden panels, but also I found the locals very friendly and helpful, albeit their rather intimidating inquisitive look. Also, it was Palembang’s general openness which left a long-lasting impression on me. 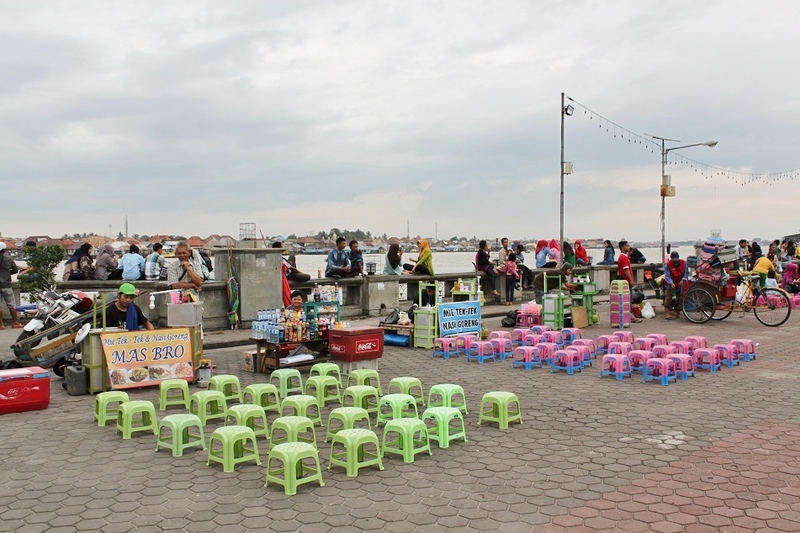 One afternoon as we were strolling around the riverside promenade, bustling with colors, sounds, and activities, Palembang’s daily life unfolded before our eyes. A happy-looking busker, probably in his early 30s, played his guitar and sang fresh renditions of some of the most popular Indonesian pop songs around diners, themselves enjoying their early dinner on colorful plastic benches. Young couples walked hand in hand, parents played with their children, cartoon-character-shaped helium balloons floated in the air, winged spinners flashed bright colors as they slowly glided down in midair. The joy and energy of the locals were evident. 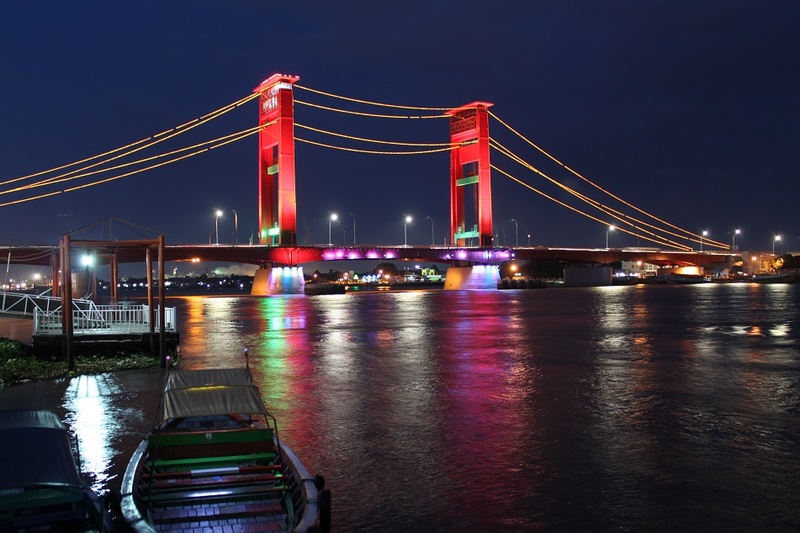 “I like Palembang, because the city doesn’t try to look beautiful,” James said to me with a somewhat contemplative grin. A few days after I returned to Jakarta a coworker asked me why I went to Palembang. “You can’t snorkel there,” she said. Obviously you can’t snorkel at the Musi, but the river has made the city what it is today, where economy thrives and life flourishes. As James said, Palembang was not pretty, but I was pleasantly surprised by its honesty. Today the city is preparing itself again to host an international sporting event, this time bigger. As the 2018 Asian Games loom, Palembang will once again welcome a large number of athletes, delegates, and visitors, and present its unconventional charm to them. Waa I want to visit the museum very much, Bama. Those Bodhisatva statues should have a lot of stories to tell. Beautifully written! 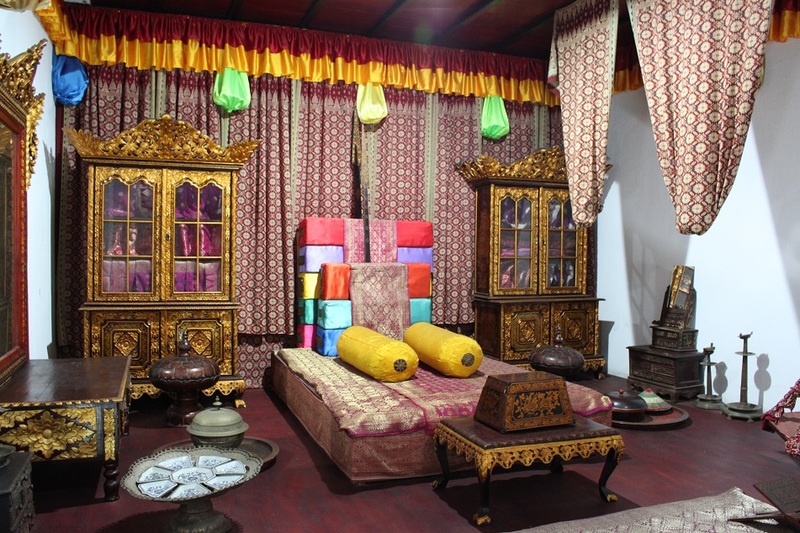 The museum houses a considerable amount of artifacts from the Srivijaya Kingdom, but sadly some parts were rather in poor condition — a problem shared with many other museums in Indonesia. Anyway, it’s still worth a visit. Thank you, Gara. That’s a really illuminating post. Love James’ quote about Palembang. Too often, places lose a bit of themselves while catering to people who don’t live there. The longer I travel, the more I’m attracted to the smaller less-heralded places that don’t try very hard to impress. I couldn’t agree more with that. Recently Skopje in Macedonia spent millions, and quite probably billions, of dollar to gentrify the city. But many find the city’s new face overwhelming, which is quite the contrary to the kind of impression any city would want its visitors to feel and remember. Thanks for your comment. Another excellent dive into the history of SE Asia, and was met with this perfect introduction to Palembang and the Pearl of the Musi. Incredible photos that show the human and great side of the city…and for you to understand that the “dangerous” reputation was overblown (every city has some). I was also intrigued by the fish-based dish called pempek, how was it? Thank you, Randall. Our perception of a place is often shaped not by our own experience, but rather by what is reported in the media. As for pempek, it’s one of my favorite Indonesian dishes! 🙂 Pempek satisfies both spicy food and seafood lovers, and I can never have enough of the dish. Thank you for your kind and encouraging comment, Sushil. I went to Palembang last week, on June 27-28. 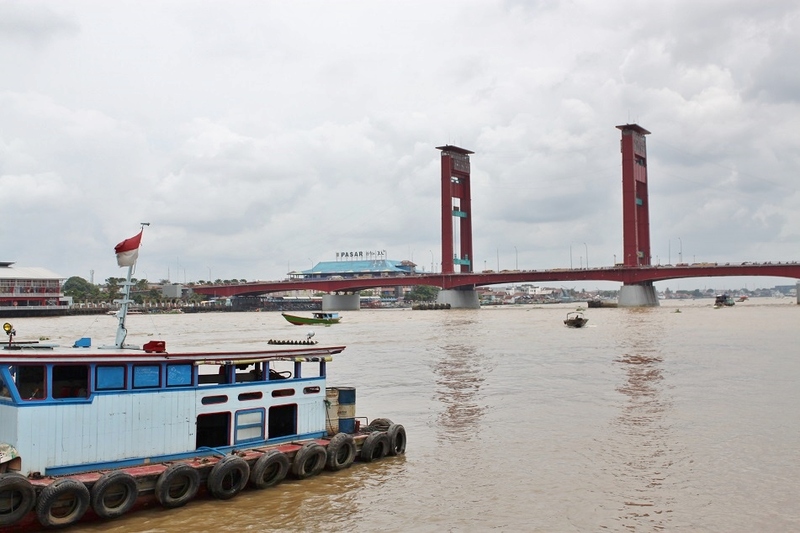 The big brown river is impressive, but I must say that local people in Palembang are not ready for tourism yet. The city should improve its safety for tourists. The rivers in Jogja and Bandung are indeed much smaller than the Musi. Hence the flourishing life along the riverbanks. Did you take the small motor boat? Ketek kalo salah bacanya bisa beda ya artinya 🙂 Glad you took the boat. I must admit I was a bit terrified. Palembang is not in most tourists’ radar, but it’s well worth a visit if you’re looking for an off-the-beaten city experience. Kamu kayaknya bakal suka sama Kampung Kapitan deh, dan meskipun di gapuranya tertulis bahwa itu adalah area wisata tapi sepertinya masih sangat sedikit wisatawan yang menjelajah Kampung Kapitan. 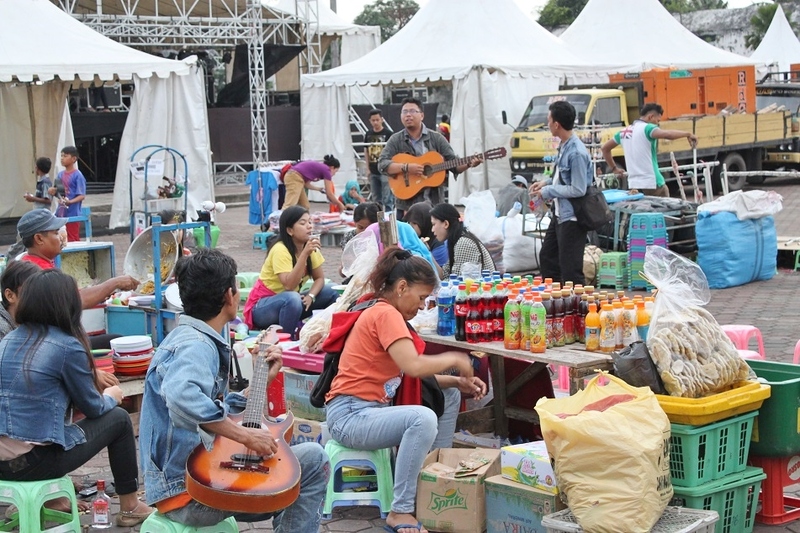 Kebanyakan berita atau artikel mengenai Palembang memang lebih banyak menyoroti pempek dan Jembatan Ampera memang. Padahal Palembang punya hal lain yang tidak kalah menarik untuk dieksplorasi. I am a huge fan of museums and Bodhisatva statues. These pictures are very beautiful. You should check out my blog sometime, you may like it. Thank you. 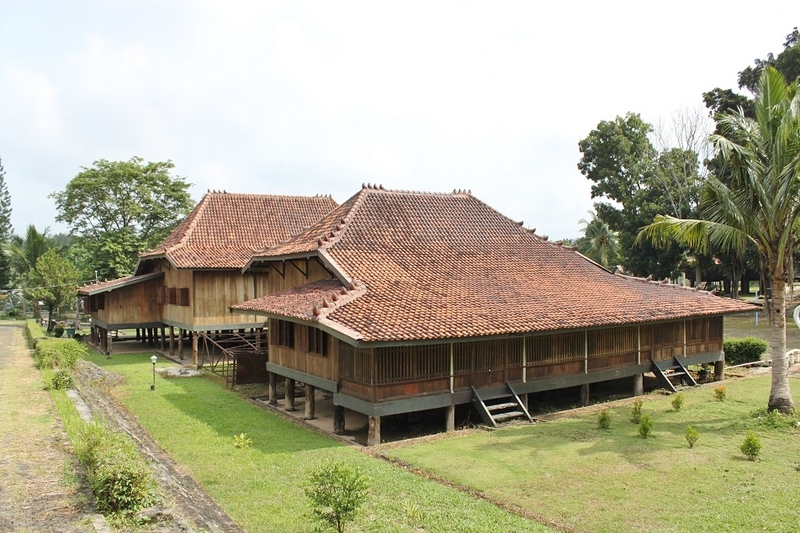 In the past few weeks I visited a number of museums here on Java. 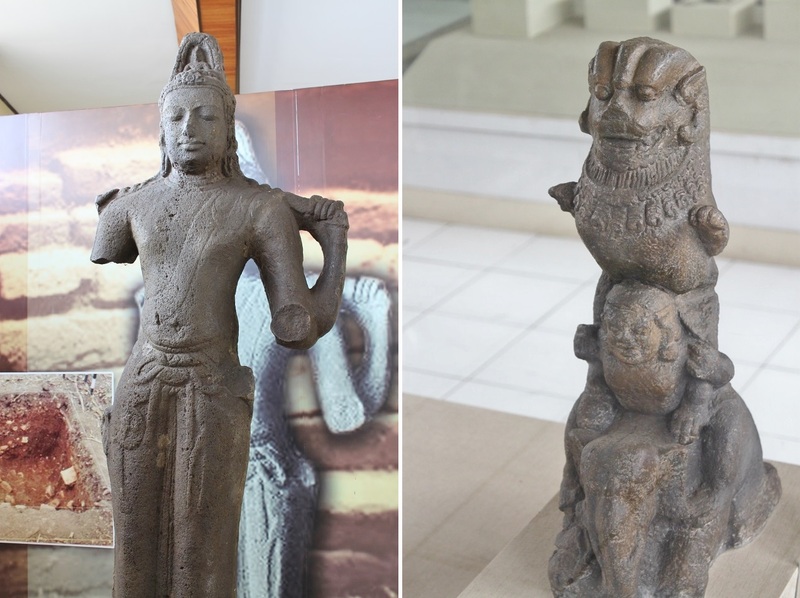 Bodhisatva and Hindu deity statues were some of my favorite artifacts. 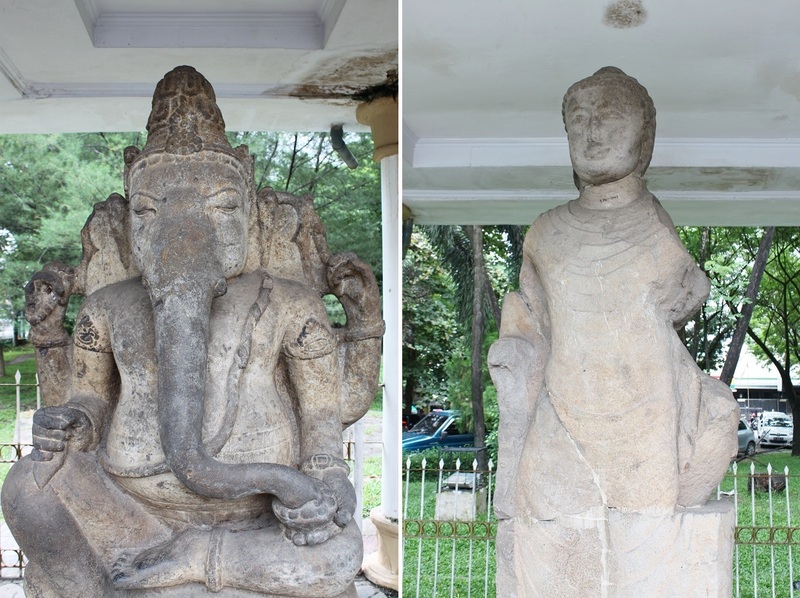 How long have you been interested in Bodhisatva and Hindu statues? Since I was little I believe, shortly after my first visit to Prambanan Temples in Java. Thank you, Indah. Even though it was mostly cloudy and rainy when I was in the city, Palembang was such an interesting place to visit nonetheless. interesting photos, and informative write ups. Thank you, Sandy. Glad you enjoyed this food post. And thank you for reading, Vincenzo. Loving your Indonesia updates Bama. These will form my go to guide to Indonesia when I eventually get there. And yes, I too often prefer real cities to Disneyfied ones. Foto2nya bagus terutama di kampung apung pinggiran sungai musi. 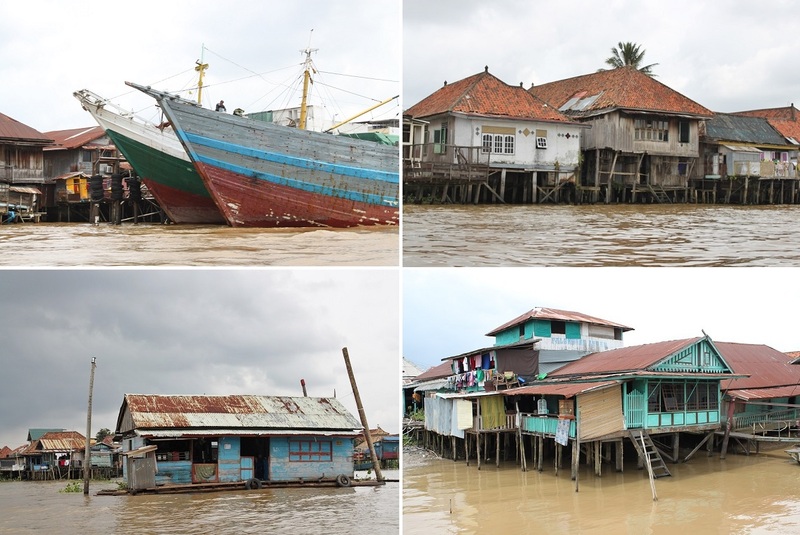 Kalau dulu saya pikir namanya kampung Arab sesuai info bapak perahu ketika saya minta turun ke perkampungan yang banyak terdapat rumah berusia 100tahun di pinggir sungai Musi sepulang dari Pulau Kemarau. Perjalanan saya dulu tahun 2010 mengunjungi rumah teman kuliah di Palembang ceritanya dan diantar berkeliling. Stadion Jakabaring waktu itu masih baru sekali. Suasananya kurang lebih masih sama ya bikin kangen. Halo Anita, terima kasih ya. Wah tahun 2010 berarti sekitar 6 tahun setelah PON Sumsel ya. Di bayangan saya stadion Jakabaring pasti kondisinya lebih terawat waktu itu. Mungkin juga di pinggiran Sungai Musi tersebut banyak orang Arab yang tinggal, karena biasanya orang dari jazirah Arab, India, maupun China yang datang ke Indonesia menetap di daerah dekat pantai atau dekat dengan sungai yang notabene adalah pusat perdagangan. Wahh..apa jakabaring tampak gak terawat ya sekarang? Sayang sekali, dulu temanku bangga sekali nunjukin Jakabaring memang masih cling gress hehe..kita sampai pose duduk-duduk selonjoran di rumput tengah stadionnya. Terakhir ke sana pas lagi musim hujan, dan atap stadion utamanya banyak yang bocor karena berkarat. Sungguh sayang, tapi agak aneh juga melihat kondisinya seperti itu karena tahun 2011 yang lalu Jakabaring menjadi salah satu venue SEA Games juga. Thanks for sharing! I hope to go to Palembang this year. You’re welcome. Going in the dry season would be great! I think May or June should be good. It’s towards the end of rainy season and not yet too hot, usually. 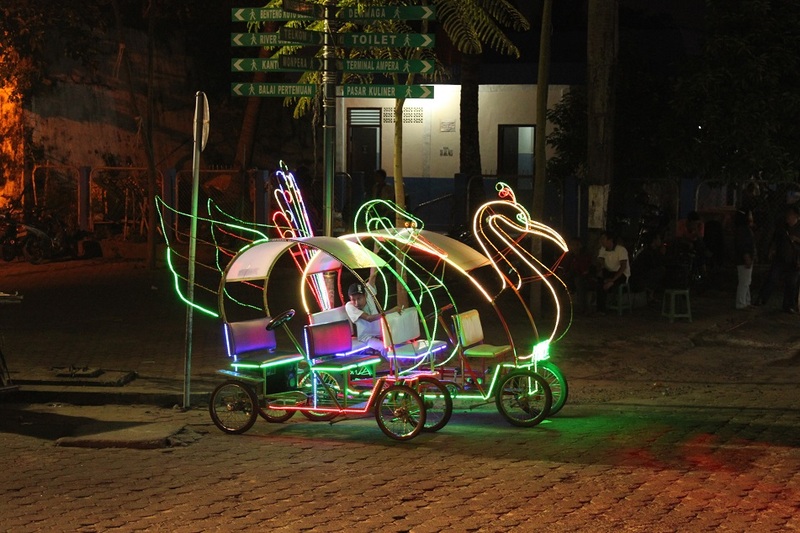 Pingback: A Tale of Three Cities: Jakarta | What an Amazing World!